Waponi Woo came with two anchors. The one we used up in Puget Sound, a 22kg bruce, and a 40lbs Fortress, which we have never used. The bruce worked well in Puget Sound; we could usually get it set in one try without too much trauma. It held well on our way down the coast as well. We did a little bit of dragging in Santa Cruz and had to re-anchor, but it was a relatively empty bay and the conditions were calm. 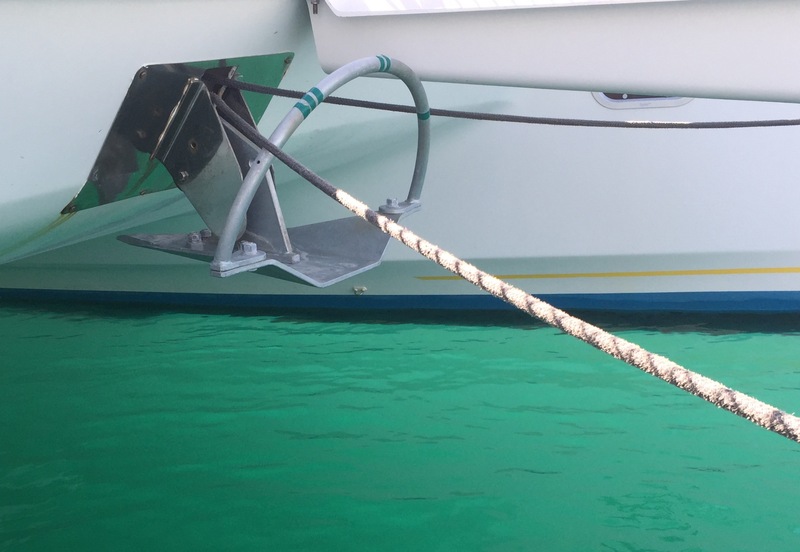 When we hit Cabo at the end of the Baja Ha-Ha and encountered our first time anchoring in a real sandy bottom, we discovered our old reliable bruce was not the anchor we need for Mexico. We turned to our fellow cruisers for advice and were told Rocna or Mantus was the way to go for what we would soon be encountering. 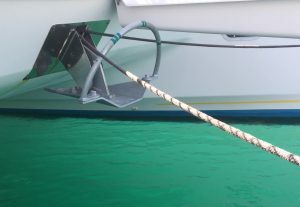 After performing some additional independent research, I realized not only did we have the wrong type of anchor, we also were using an under-sized anchor. Incorrectly, we assumed the ground tackle used by the previous owner was adequate. There was the complete set-up for anchoring in northern waters, but not the conditions we were heading towards. In the end, we decided on a 65 pound Mantus. The deciding factor between the Rocna and the Mantus came down to the cost to get it to Mexico. I ordered it online directly from the manufacturer and had it shipped to the marina in La Paz. It arrived in about one week from the States. Mantus anchors ship in two pieces so it didn’t seem two unusual for two boxes to be waiting for India and I at the marina office when we went to haul it down the dock. India and I managed to get both boxes loaded into the cockpit and I promptly opened the first box. It contained one complete anchor. I slowly lifted the corner of the second box and took a peek. It also contained one complete anchor. We only ordered and paid for one. At first, the manufacturer told me to just take the extra anchor to the nearest UPS facility to have it shipped back to the States. I gently informed them I am in Mexico and don’t have a car. They kindly told me to use whatever means of shipping it back would work best for me and to let them know. I didn’t ship it back. Instead, I talked to my neighbors on the dock. They were also in the process of deciding which way to go for a new anchor and this one now had the advantage of being here. We worked out a deal with Mantus for my neighbors to purchase the extra anchor saving me the hassle of getting it back to them and my neighbors the cost involved in getting the Mexico. This is a considerably larger anchor than what we previously had. We had to do a little creative engineering with the bow roller to keep it from hitting the fiberglass but it fits. We added some tape to the roll bar for under-water visibility and then waited for other projects to be complete before heading out. Several months later I am still quite pleased with this purchase. Nine times out of ten it sets on the first try and has held in up to forty-one knots of wind. My confidence sleeping on the hook grows each night we spend with our Mantus firmly planted in the ground. This entry was posted in Uncategorized on May 13, 2017 by Caroline Spott.